Cardi B Blast NYPD For Officer Placing Her In A Chokehold !! 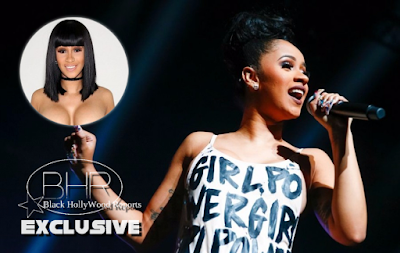 BHR Hollywood Reports............Rapper Cardi B, who currently has the No. 2 song in the country with "Bodak Yellow," recently tweeted that a New York police officer put her in a chokehold. Cardi, born Belcalis Almanzar, hails from the Bronx and lives in Edgewater. "I can't believe this cop put me on a choke hole just now sh*t is crazy these NY cops don't know how to do they job F*** 12," Cardi posted in a now-deleted tweet on Tuesday, according to Rap-Up, which noted that the rapper has a history of being vocal about police brutality. 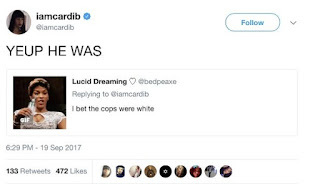 hen one fan replied to the tweet, wondering if the police officer in question was white, she tweeted back: "YEUP HE WAS [sic]." 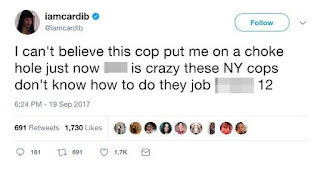 Cardi, who grew up in The Bronx, accused the police of not knowing how to do their jobs in the original tweet, which quickly gained traction, being liked nearly 2,000 times before it disappeared from her timeline. 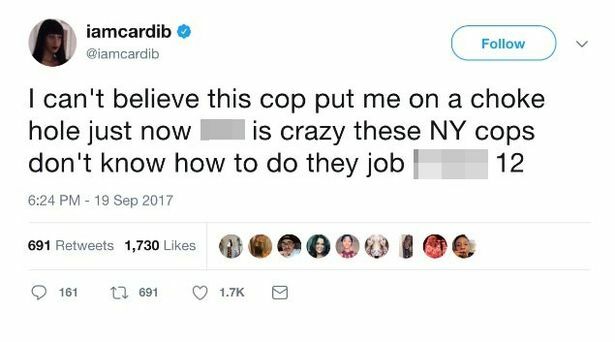 A spokesperson for the NYPD told Mirror Online: "The NYPD was made aware of a Tweet made by rapper Cardi B, which was since deleted, and indicated an alleged interaction between the NYPD and her. 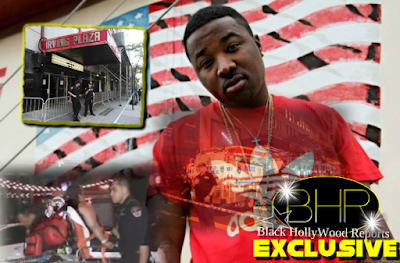 "The NYPD has no record or any other information to support the validity of this claim." Before she rose to the top of the Billboard Hot 100, Cardi was frequently seen on TV as a cast member of the VH1 reality series "Love & Hip Hop: New York."